While we were in Chagos, a very large sailboat with a crew of about 8 people pulled into the lagoon one day, eventually launched a large RIB and came ashore at Île Boudin, where a group of cruisers had congregated at the 'yacht club'. The people from the mega-yacht were friendly enough, a collection of crew from all over the world, including one woman from Namibia. She was the first Namibian I had ever met and not what I had expected a native Namibian to look like. Not only was she tall and attractive, but fair-skinned with blond hair and blue eyes. Many cruisers who sail around South Africa stop in Namibia and I peppered her mercilessly with questions as it always sounded so remote and wild to me. She said that it was a beautiful country but the weather was frequently bad. The part about the bad weather stuck in my mind as being the epitome of a 'fair-weather' sailor, I prefer to avoid any place with a poor weather reputation. However, as we were preparing for our departure from Cape Town, we knew of many boats in our 'fleet' that were intending to stop in Namibia so we decided to do the same. After a harrowing departure from the Royal Cape Yacht Club in 30 knots of wind (there was a lull when we cast off the dock lines – it had been as high as 50), we made our way to Robben Island, a UNESCO World Heritage site, where Nelson Mandela had been imprisoned for many years. The sail there was delightful as it was a downwind run and the winds had abated to a moderate level. On the north end of the island is an anchorage which is popular with fishing boats although much of the bottom was foul with rocks. After spending so much time at dock, it felt good to be on the hook again in a protected anchorage, but we were prohibited from landing a dinghy on shore. 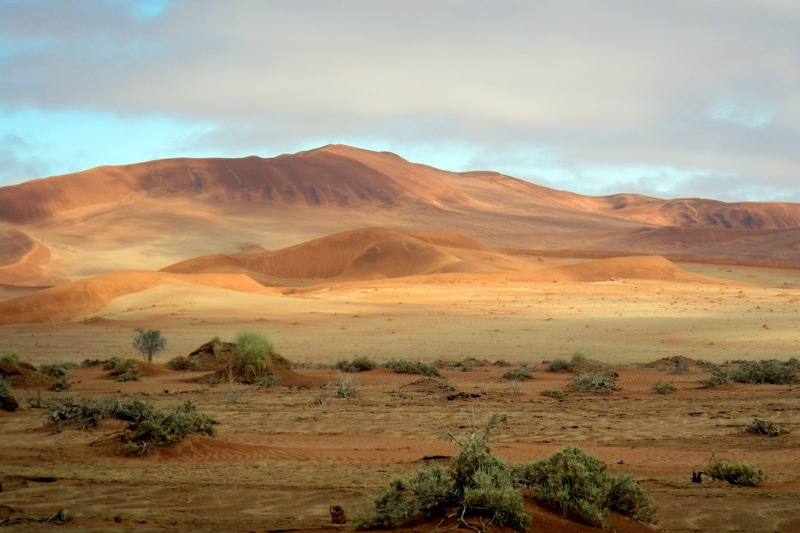 The following morning we began the 3-day passage to Luderitz, Namibia, in light winds. It was a combination of sailing, motoring and motor-sailing but we arrived in Luderitz in the morning and our friends on Amigo, who were already there, helped us tie up to a mooring. The clearing in process was simple enough though we did have to pay a small fee for arriving on a weekend. The South African rand is accepted everywhere and is the exact same exchange rate as the Namibian dollar. Together with Helga and René, we explored the area, including a trip out to Kolmanskop, a 'ghost' town from the diamond mining heyday. 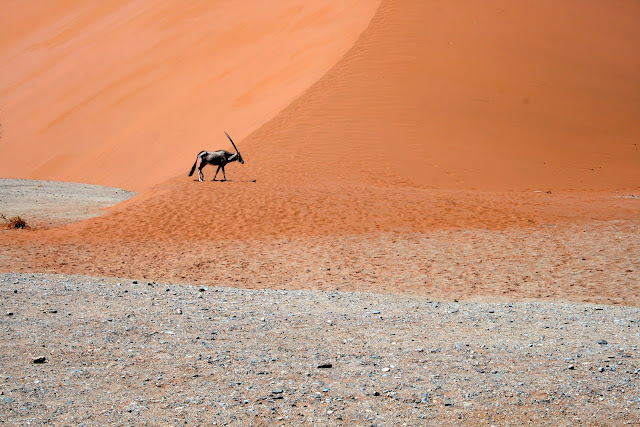 One of the 'must see' places in Namibia is the dunes of Sossusvlei which is a solid day's drive from Luderitz. 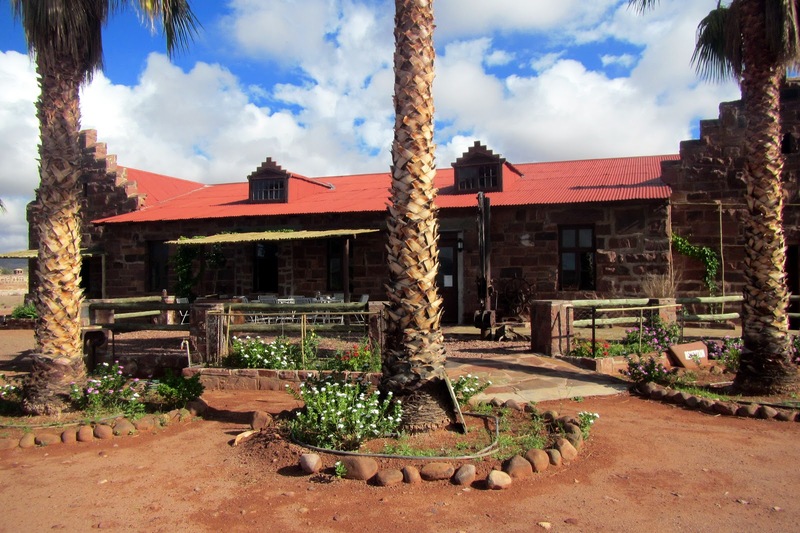 Helga, René, Ruthie and I piled in to a rented 4-door, four-wheel drive pickup and made our way over the mostly dirt roads, arriving at the Lodge at Sossusvlei just as it was getting dark. 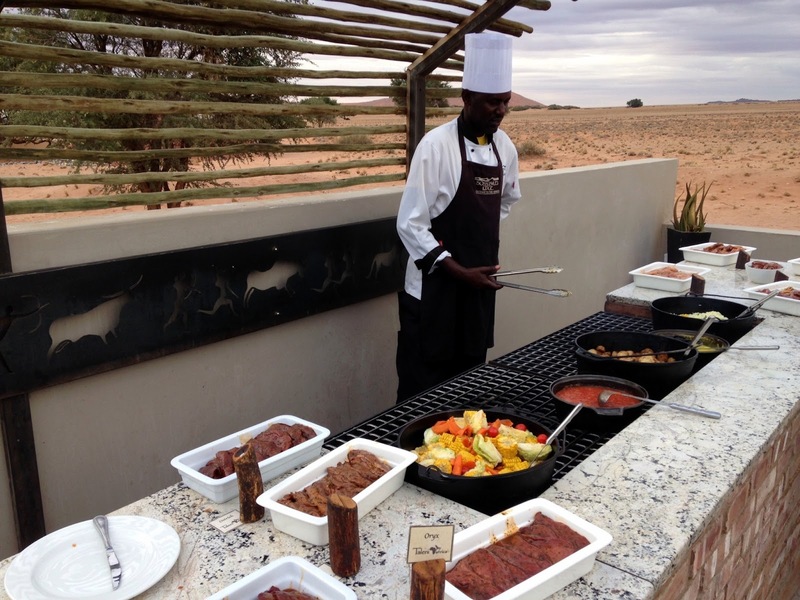 We had no reservation but the lodge has an excellent reputation for very high quality – along with a reputation for very high prices. One thing I have learned about the hospitality industry is that there is nothing as perishable as an unrented hotel room. If it goes unrented for a night, there is no way you can recoup that loss of income for that night. Many hotel managers are compensated on the Average Daily Rate and this motivates them to keep as many rooms occupied as possible, even if it means discounting the room heavily. Towards evening, when most people have already made their choices of where to spend the night, many front desk managers are willing to make extraordinary deals. We lucked out this time as they offered us a 50% discount for the night that included a fantastic dinner buffet, breakfast and private cottages for each couple. Even though we only stayed there one night, we quickly got used to the luxury. We were up well before dawn as the conventional wisdom is that you start your hikes up the dunes just as the sun is rising. The dune we wanted to climb was in a remote part of the national park and having four-wheel drive was no guarantee that you wouldn't get stuck. I know a little about driving in rough terrain and I groaned loudly when the truck in front of us slowed to a crawl and then stopped completely in a particularly rough section. Keeping the engine RPM high and shifting into low range, I was able to swerve around them and keep moving – in the rear view mirror, I could tell that the cautious driver was going to spend a good deal of the morning trying to get his truck unstuck. 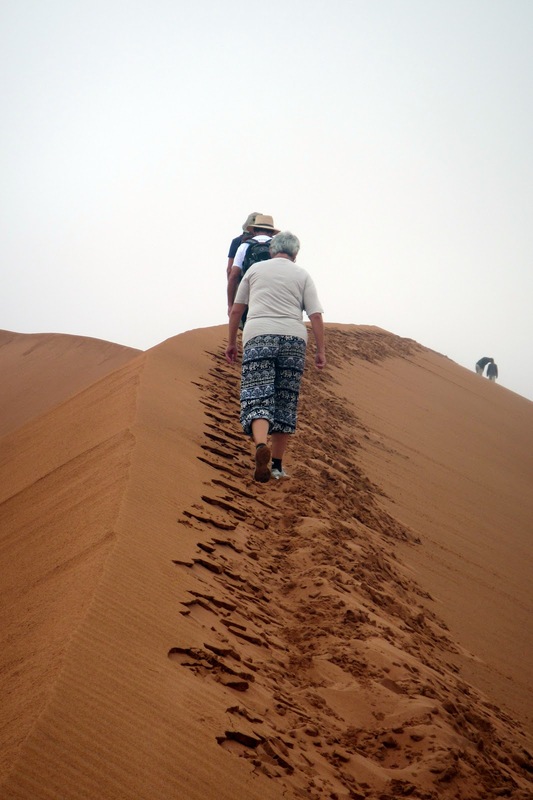 Climbing the dunes was fun although coming down was more fun that hiking up. That night we stayed at a farm that has rooms available for travelers, which is common in Namibia, right next to Duwisb Castle. 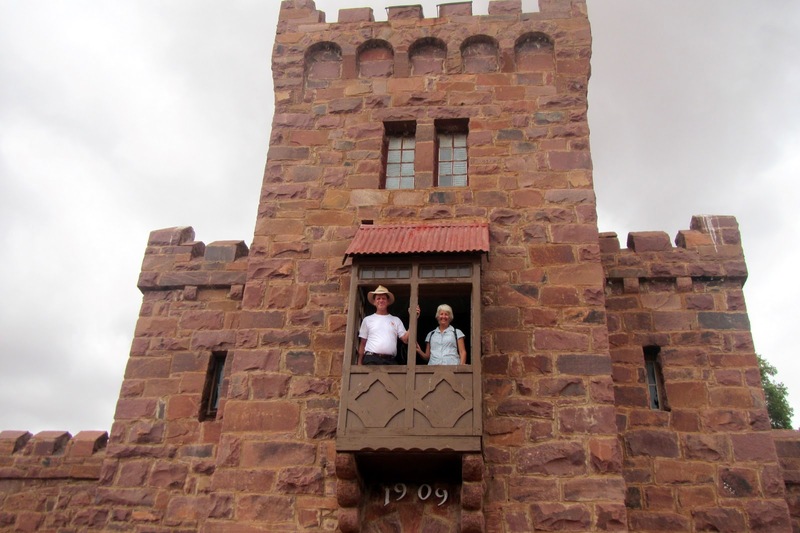 As we toured the castle, we learned that it was built in 1908 from materials wholly imported from Germany. Helga and René, who are from Austria, were having a delightful time in Namibia as German is an unofficial language that almost everyone speaks. 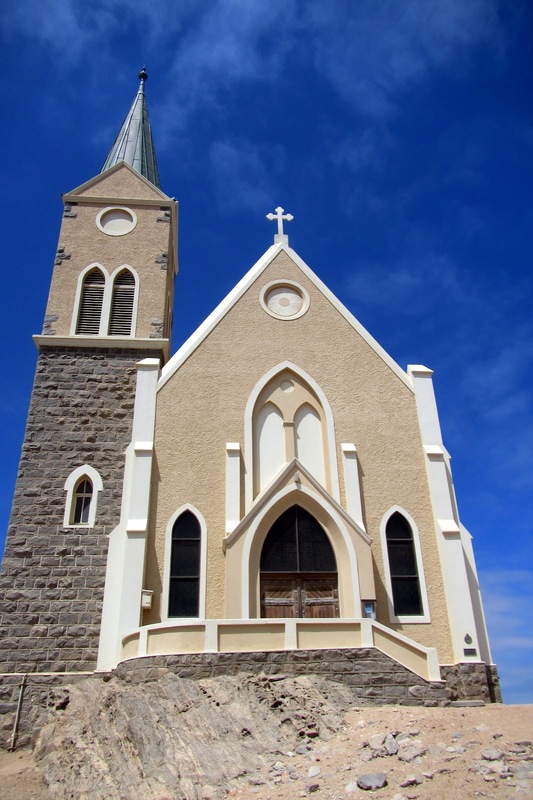 Our host that night kept us entranced with story after story, including one that captured my imagination about the interment of thousands of men of German ancestry from Namibia (then called German South West Africa) into camps in South Africa at the beginning of World War I. This left hundreds of women to manage the huge cattle stations that their now-interned husbands used to operate – almost overnight. With the harsh climate, the rationing of fuel and the enormous size of these ranches, it was amazing that tough men could survive. That the women where able to succeed and even take many of the ranches from being heavily in debt to being profitable is nothing short of a terrific basis for a remarkable book. 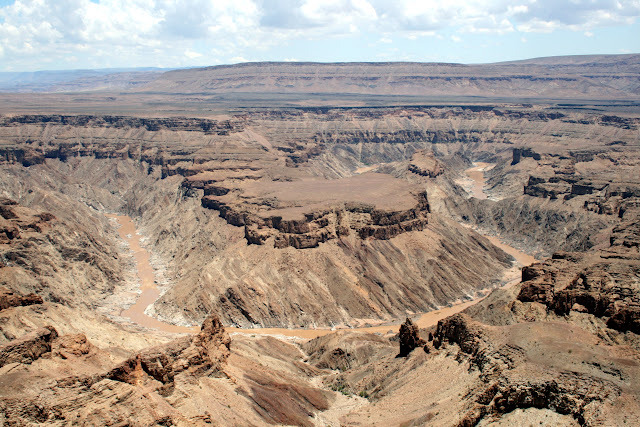 Someone had told us that the Fish River Canyon was second in size only to the Grand Canyon of the southwest United States and worthy of a visit. 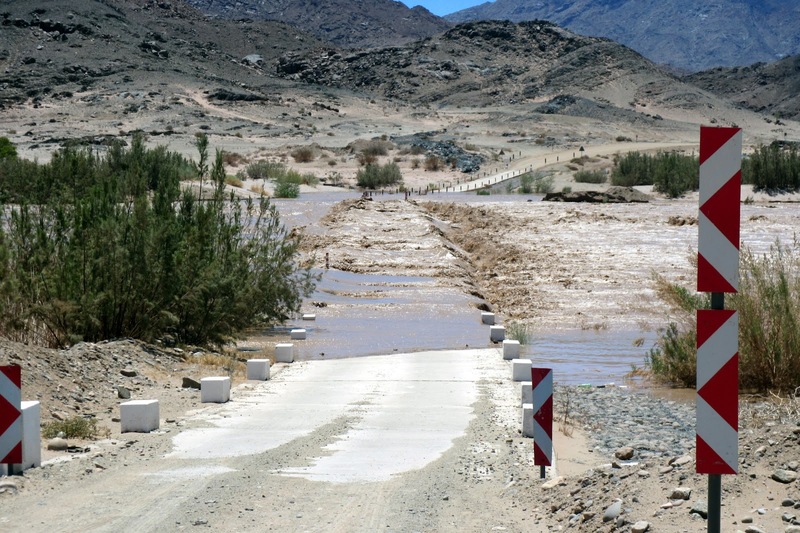 It was on the border of South Africa and took us most of the day to drive there, the flat tire we had on the way only slowed us down a little (many people advise that when you're renting a car in Namibia, insist that it comes with two spare tires – we hadn't). 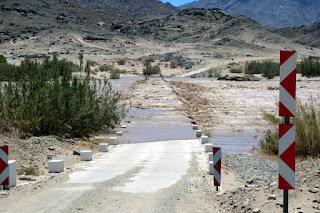 We paid our fee to enter the national park but we came to a place where the road forded the river, which is usually shallow and slow moving, however, that day, due to some extraordinary rains to the north, the brown river was raging, with high waves and much white water. This meant that we had to turn around, drive to where there was a bridge that went across the river and then make our way into the canyon, a detour of about 300 kilometers. 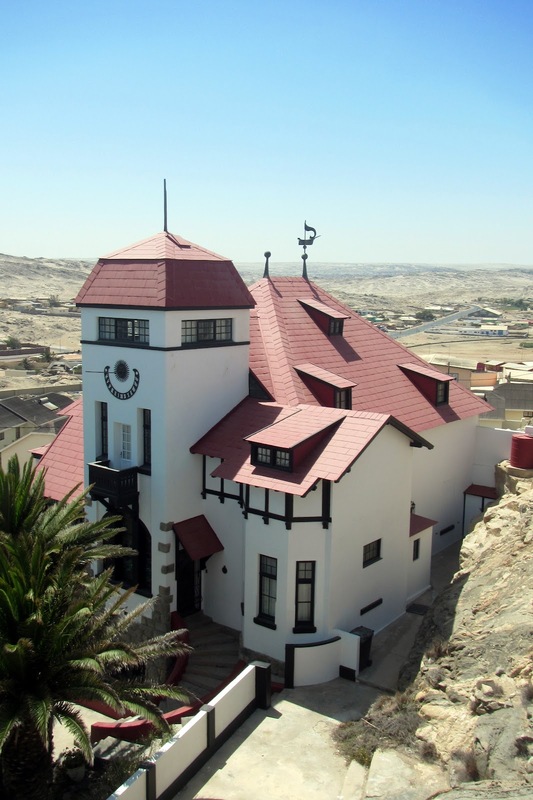 Once back in Luderitz, we cast off the mooring and made our way to Walvis Bay, about 150 miles to the north. This was an important stop for us as we would need to provision for our passage to St. Helena, the small island in the South Atlantic, about 1,200 miles away. Rendezvousing with Helga and René again, we rented a car and drove to Swakopmund, a very German town about 30 miles from Walvis Bay. Everything about the small city was quaint and charming, with fabulous restaurants and great places for coffee. We were able to buy good German sausages, cheeses and breads, promising passage meals that would be unique and delicious. In retrospect, I am worried that we almost missed Namibia based on the woman we met in Chagos, who said the weather was bad. Not only was the weather we had very good but we loved the country and really enjoyed ourselves there. The spectacular beauty – often rough and rugged – and the over-the-top friendliness of the people will be memories that we'll never forget..
Fabulous pictures, wished we had the time to explore there. Cheers, from Tobago.